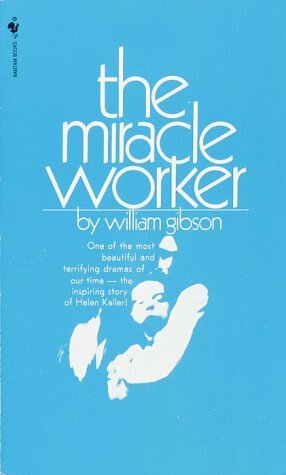 Following a recent book exchange, I came away with The Miracle Worker by William Gibson. Though I hadn’t known anything about the book, I became curious when I discovered it was about Annie Sullivan, Helen Keller’s teacher. And so I traded my already-traded copy of Marilynne Robinson’s Gilead for it. Growing up, I’d bought both Helen Keller and Helen Keller’s Teacher from Scholastic book orders. I’ve not re-read them since I was a kid. But what I remember, I liked. Helen Keller was deaf, dumb, and blind by the time her teacher, Annie Sullivan met her. Annie “miraculously” taught Helen how to communicate by signing letters into her hand: hence, this book’s title. I was surprised to find that The Miracle Worker is a stage play. I don’t read many plays — I think the only ones were required for school. Perhaps it’s because I’ve found them difficult to slog through; I’d much rather see them performed. But as I began reading this one, I found myself intrigued. I was struck immediately by the invitation to imagine in the initial stage directions: ” . . . The convention of the staging is one of cutting through time and place . . . the less set there is, the better. . . . Apart from certain practical items–such as the pump, a window to climb out of, doors to be locked–locales should be only skeletal suggestions, and the movement from one to another should be accomplishable by little more than lights.” I hadn’t realized that stage directions could be so informative, so delightfully interpretive. I liked it. They suggested, and my mind filled in the gaps. Except for a few directions of set and lighting, the play at the beginning was mainly dialogue. And yet, there were also large sections of the play in which no dialogue existed, especially scenes between Annie and Helen. Rather, there were paragraphs and even pages of italicized words to indicate action. The play, then, is a series of dialogue and action — of saying and hearing speech, and of seeing action. These are the vehicles through which Helen’s story is represented and understood by an audience. And yet, Helen herself, being deaf and blind, ironically would not have been able to experience these powerful sensory details. Except, of course, I was not watching the play on a stage: I was reading it in a book. And as I read, I realized that the narration of the actions seemed to cater more to the reader’s imaginative creation rather than an audience’s viewpoint . . . or an actor taking up a script: the flashbacks, the stage directions which seem to be more cues for the readers, the way we see the formation of the letters in Helen’s hands, the latter an impossible action to see in detail if translated into a stage play. I thought about what a stage play offered that a piece of written creative nonfiction could not, mostly because I write creative nonfiction. Like a play, a piece of creative nonfiction will often include scene. I admittedly struggle to include scenes in my own creative nonfiction, and when I do, it is often dialogue heavy: I resist even attempting description and imagery. In a stage play, the imagery is perhaps already there: in the set, and what the actors bring to it. In the case of The Miracle Worker, a lot of work was done with water imagery, keys, looked doors, and open windows, symbolism all leading up to the symbolic unlocking of language at the physical outdoor pump when Helen finally realizes that water has a name associated with it — those letters which Annie had been spelling into the palm of her hand. All of this made me wonder about the genre of a stage play: Why do we read a stage play? Is the imaginative visualization of the play, in this case, its performance? If so, perhaps we perform every time we pick up a piece of literature and read. If there is dialogue, and if it includes the literary techniques of imagery and scene, we can potentially hear it, view it — by imagining it — as though a play in front of us. For someone who resists using these techniques (mainly because I am not adept at them), it’s a good reminder that it is, indeed, through these senses that the majority of us understand the world. Question: How does reading different genres inform your writing, or reading? What is Creative Nonfiction, Anyway? I like what you wrote about reading in different genres being helpful for any field of writing, and that a single book can be beneficial to multiple genres, as in your case with the local nonfiction book you’re reading. And how true that the beauty of language, read anywhere, can inspire us with poetry of our own! Especially liked what you wrote about finding beauty in the mundane. I found it interesting about what you wrote about why you read certain genres – escaping reality with fiction, and seeing it at a slant in creative nonfiction (reminds me of the title of a nonfiction book called *Tell is Slant*). It makes me ask myself why I read certain genres, what draws me to them. Neat that it can be for different purposes. Yes, and I know what you mean about having the time to sit down and write all the ideas down!